Having spent most of yesterday arguing with a hot, lethargic cat who wanted nothing more than to rest in the middle of the table, on top of my sewing, or on the floor, on top of the quilt, I gave up. Today I packed up and went somewhere cat-free. I could have just sewed this to yesterday's chunk and called it quits, but I had a notion that I wanted to do just a wee bit more. I wanted to add to sandy band at the bottom of row 2, as it was very narrow in places and I reckoned that by the time I lost the seam allowance it would virtually disappear. And this, for now at least, is the best shot I can get of the whole thing: it has turned out to be blooming big! I've had a great time putting this together, for all sorts of reasons, so thanks go out to Julie for writing the book and sparking the whole thing off. Just in case you've somehow missed it, here's the link to her book's blog and if f you haven't tried free piecing, I would thoroughly recommend it - the possibilities are endless. Since I don't often have the opportunity I'm linking up with Whoop Whoop at Confessions of a Fabric Addict and TGIFF at A Quarter Inch from the Edge as well as NinaMarie. Somehow along this adventure I lost track of the size of your pieces! Give yourself a BIG back pat; it works! You did it!!! I love the added sand, it pulled it all together in a way I didn't expect! Now you can take a breather...until quilting time...That will be fun to see too! I love it! You did perfect! Wow, this looks great! I love it! Free piecing is fun, isn't it? This is absolutely splendid -- congratulations on a fantastic quilt top and thank you so much for sharing your process with all of us! It is certainly big and definitely beautiful! So very very cool! It all hangs together beautifully! What fun! You did an excellent job listening to your instincts. Have the beach separating the rows gives the lighthouses a place to rest. It came together so beautifully! I know what you mean about fighting a cat (as mine is perching in my lap at the moment weighing me down even in the heat, ugh!). I am so impressed with the size and love how it looks assembled. Gorgeous! This is a splendid quilt top. I can't wait to see how you quilt and finish it! Well Kaja it may be blooming big but it's also blooming beautiful. It looks fantastic all pieced together. I'm glad you enjoyed the process making this wonderful. quilt. Oh wow! it's beautiful Kaja! I knew it would be, but suddenly (seeing all together) it's a stunner! Your combination of blues and beiges work very well together. Including your words was brilliant. They are some hard working little words as they complete the theme, connect the colors and give another reason to come close. Can you tell that I LOVE it? I laughed at your "blooming big" phrase. Every now and then you say something that reminds me you're somewhere far away. We comment and email so that I sometimes forget. Super quilt top, I enjoyed seeing it come together. very cool top! Love the strippy back ground! That is gorgeous, Kaja. It shines like a beacon, drawing me in. So very beautiful! Oh it is so lovely Kaja. It is difficult to properly balance all those colour and fabrics but you did it so well. I love the addition of the sandy beach too. It has been lovely watching the progress of this quilt, wondering where you were going with it, and it is almost sad it is coming to an end. Congratulations on a beautiful quilt. Such an achievement in terms of composition and how to fit it all together in an aesthetically pleasing way! It's beautiful and it's so captured the atmosphere. Everything about "All at Sea" makes you want to step closer and take in all the wonderful details. It's a masterpiece Kaja! I love it even more with the sunlight shining on it! I love the lighthouses. Splendid. I won Julie's book and will be trying my hand at soon. You'll have to get a very tall, wide friend to hold up your quilts. 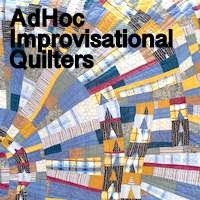 Your quilt looks super. So summery . I'll have to check out that book. Absolutely incredible. I think it is magnificent! I reckon it should be entered in a show, though guard it whilst on display in acse its purloined! At least send a pic to a magazine for them to do a spread on it for others to see too! What a great finish! And I never would have guessed its size from your previous posts. I love looking at all that's going on with the horizontal lines in contrast with the vertical lines of the lighthouses. What an absolutely smashing quilt - how happy you must be with this! Congratulations on a superb finish. My eyes go for a walk on this incredible quilt. So much to discover. You are ingenious. WOW! I've really enjoyed watching this develop. Congrats on another beauty. Wow! All the wow there is! It's absolutely stunning. And it's been so interesting watching it grow - thanks so much for sharing that! Oh, this is absolutely amazing! Improv lighthouses. Love it! Thanks for linking up with TGIFF @ A Quarter Inch from the Edge! It is awesome, Kaja, I really love it! Great finish, and enjoy the rest of your summer! Really like how this turned out - it has been great fun following your journey with this one!